The cooperation agreement was signed in the framework of the first China International Import Expo (CIEE), which is being held this week in Shanghai, the AWDC said. The Antwerp diamonds will be available under the name “Shape of Antwerp” on the namesake flagship store on Tmall. The platform is secured at several levels, enabling customers to shop with peace of mind. Each diamond is accompanied by an HRD Antwerp certificate detailing the 4Cs of the stone (cut, clarity, carat and color). Additionally, HRD will laser a QR code onto the girdle of each diamond, which will include its certificate. By scanning this code, blockchain technology will enable the customer in China to follow the journey of the diamond he or she purchased back to Antwerp. 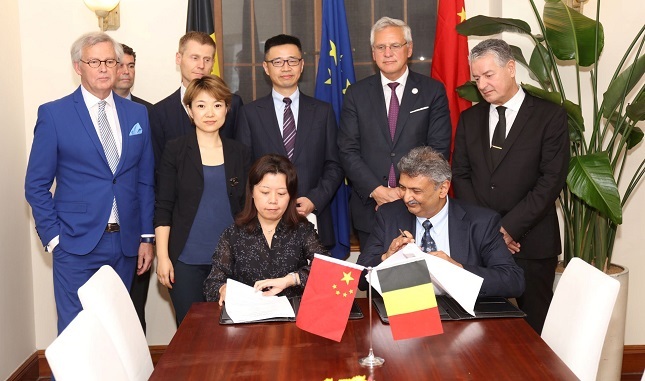 Pictured above: the cooperation agreement was signed by Nishit Parikh, President of AWDC, and Jessica Liu, President of Tmall Fashion and Luxury, Alibaba Group, in the presence of Kris Peeters, Deputy Prime Minister of Belgium and Minister of Employment, Economy and Consumer Affairs, in charge of Foreign Trade, and Zhao Ying, Chairman of Alibaba Global Business Group. The signing took place in the residence of the Belgian Consul General in Shanghai.